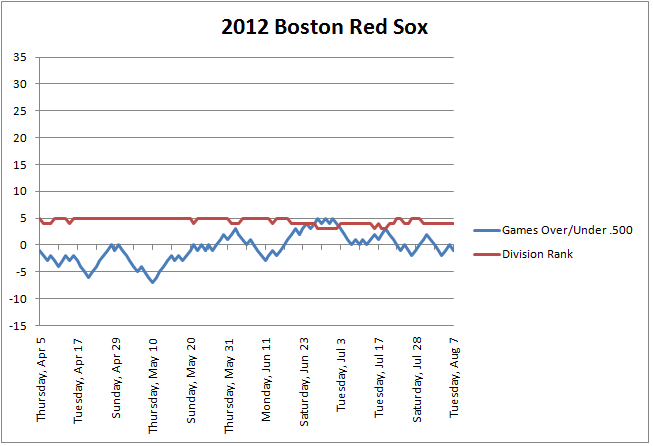 ← Jenny Dell has nothing better to do on a Sunday morning than mine through obscure statistics on BaseballReference.com? The first two graphics provided below are examples of ball clubs that experienced rocky beginnings to the season, a relentless rash of injuries and poor performances from highly-paid star players. These two teams were managed by Terry Francona and ultimately missed the playoffs. The third graphic depicted below is the chronology thus far of a very similar ball club, with many of the same players, that has weathered a very similar storm of poor early-season luck, nagging injuries and subpar performances from star players. The team below is managed by Bobby Valentine, who continues to maintain that the 2012 squad is playoff-caliber and playoff-bound. 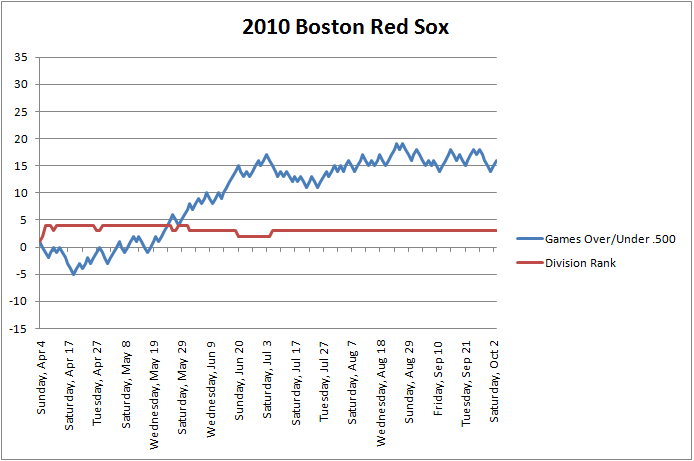 By and large, the rosters of the 2010-2012 Red Sox are comparable in terms of on-the-field talent and payroll allocation. All three had plenty of offensive firepower. Neither had much in the way of reliable pitching. Injuries to key hitters in the lineup coupled with poor seasons from highly paid pitchers were the downfall of these teams. Earlier this week, John Henry surprised some by offering his support of Bobby Valentine despite yet another August foray with .500 and last place in the AL East standings. But Henry is a shrewd man: He of a billion-dollar fortune won shorting stock market futures. Henry no doubt understands the risks that come along with volatility and he very likely recognizes the dangers of stagnation, mediocrity and under-performing assets. Four months isn’t a very long time to base a tangible evaluation of an investment in the world of stocks and bonds or in baseball management. But ignoring hard data and focusing instead on intangibles (likeability amongst players, motivational tactics, fan approval, etc.) wouldn’t exactly do Valentine any favors. That flat-lining streak of blue is all he will ever have going for him. Sure, firing Bobby Valentine is by far the most simplistic solution to more complex organizational concerns. But maybe it would give the team some sort of a pulse before it’s too late. 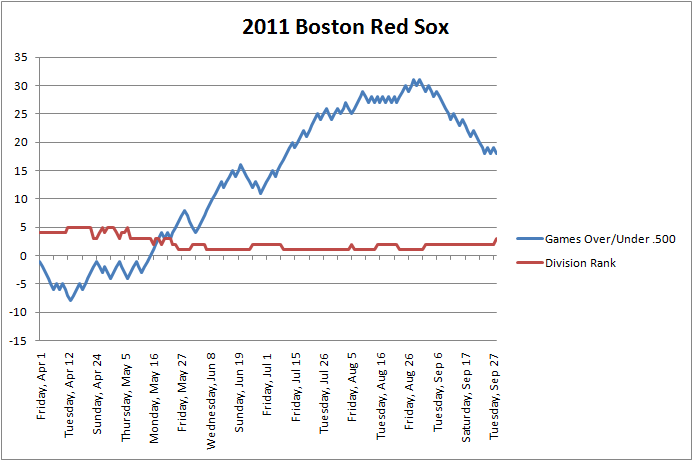 This entry was posted in Red Sox and tagged Bobby Valentine. Bookmark the permalink.